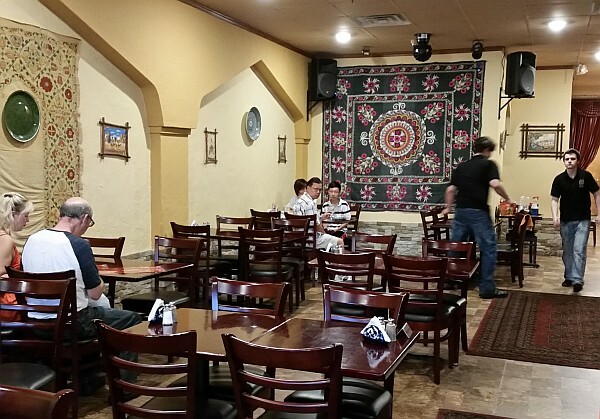 The Silk Road Choyhona Restaurant offers authentic Uzbek cuisine at 28 Bureau Drive, Gaithersburg, MD 20878 in the Diamond Square Shopping Center. The restaurant is open for lunch and dinner seven days a week. Uzbekistan is a former Soviet republic in Central Asia with approximately 31 million inhabitants. It is famous for its mosques, mausoleums and other sites linked to the Silk Road that was the ancient trade route between China and the Mediterranean. The country's official language is Uzbek, which is written in the latin alphabet, but Russian remains in widespread use. One of the first things that you notice when you open the menu is that it is written in English and in Russian. Many of the entrées listed in the menu are considered typical Russian dishes. 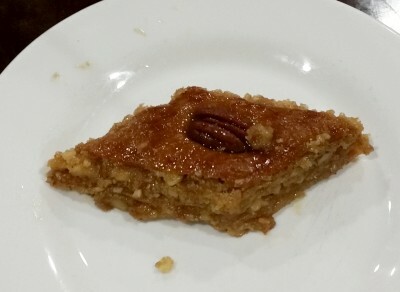 The restaurant is located in the Diamond Square shopping center across from the National Institute of Standards and Technology (NIST) in Gaithersburg. The interior is decorated with rugs on the wall. The wooden tables and chairs are comfortable, and the waiters are attentive. The beef tongue with horseradish appetizer had peas, eggs, sliced cabbage, mayonaise and dill. Ayran is a cold yogurt beverage mixed with salt that is traditional in several Asian countries. 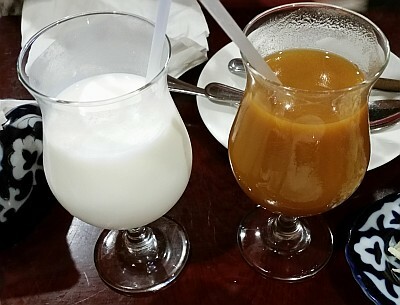 The apricot juice was similar in flavor to the canned juices. 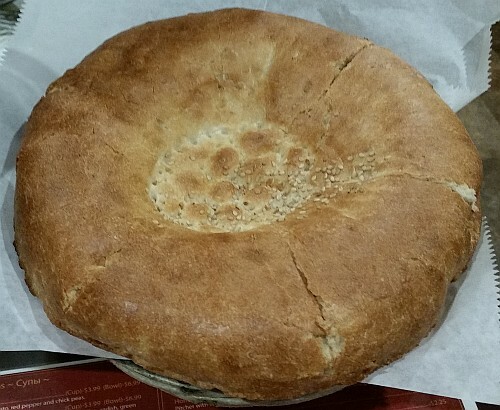 The meal is accompanied with warm Uzbek bread. The loaf is big, but it is so good that two people can finish it with the meal. 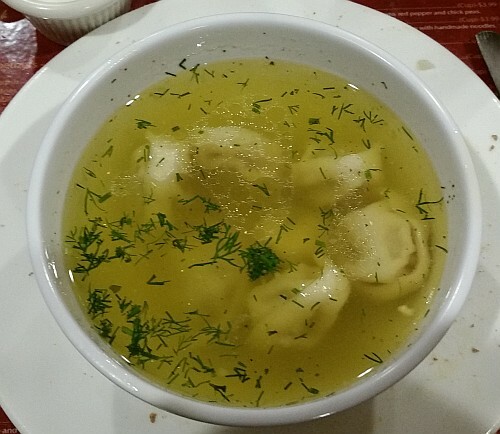 Chuchvara are small beef-filled dumplings served in chicken broth and garnished with dill. The Russian text in the menu calls them pelmeni, a well-known Siberian specialty. This restaurant has a comfortable atmosphere and the dishes taste homemade. 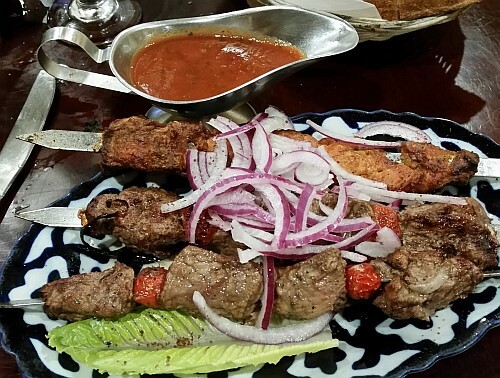 The shish kebabs are priced by the skewer, so you can order them according to how hungry you are. 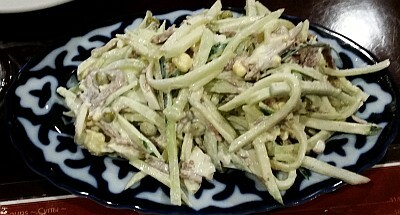 They are presented with lettuce on the plate and covered with sliced onions. A tangy tomato sauce is served in a sauce boat. 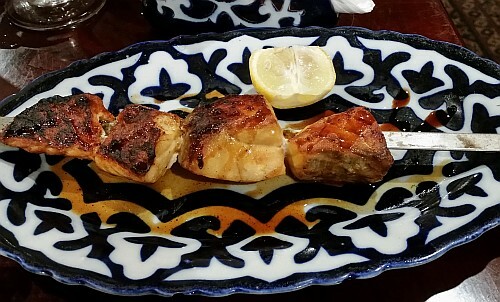 Several types of kebabs are available, including salmon, lamb, chicken and shrimp. The dessert menu includes assorted fruits, ice cream and baklava. 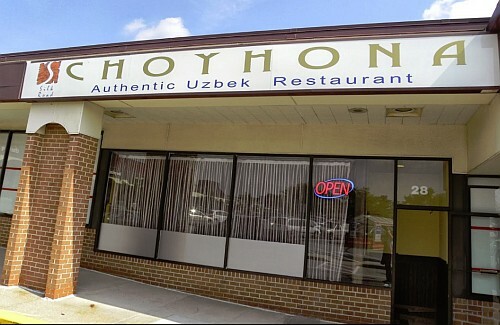 Call the Silk Road Choyhona restaurant at (301) 330-5262. The web site for the restaurant www.silkroadchoyhona.com was not active at the time of this review.